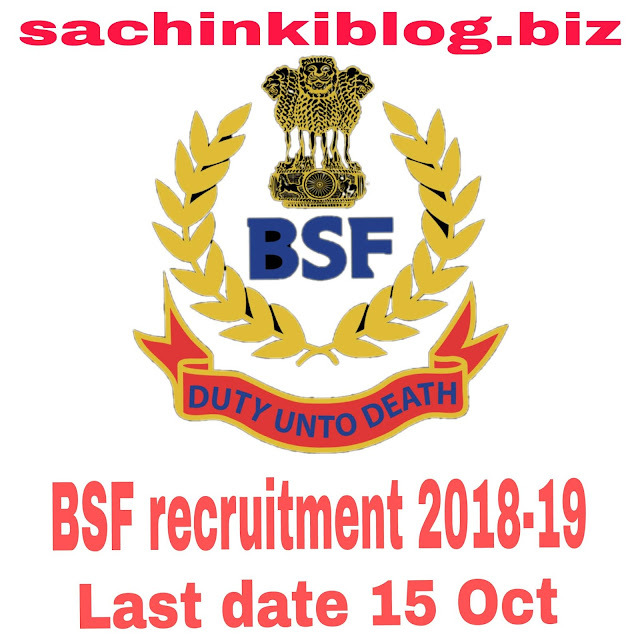 BSF (Boarder security Force) 2018-19 Has released recruitment for about 139 posts, but we haven't fixed details (so plz read full Advertisement of BSF) All eligible candidates can apply from here and read also full Advertisement of Recruitment which will be include below. Bsf has invited candidates for Generator macanic , Lineman and Generator Operator. Posts And total Vacancy is about 139 only. Sachinkiblog is providing full details about BSF recruitment in sort. Which will be easy to read and understand. So let's begin.. Written Test,Document verification,PST,Practice Test,Trade Test,Medical Test etc. * 2 cms chest Relaxation for Candidates 20 yrs below. Metrication from a Recognized Board with ITI certificate in the trade ex. Diesel and motor mechanic. With three years experience. Matriculation from a Recognized Board with ITI certificate in related field . ●Age limit :- 18 to 25 Y on Oct 1,2018. ●SC/ST/Female/ Ex-SM n BSF Candidates:- No Fees.